"Working together to create a more vibrant cultural community in Dallas"
Individual artists as well as arts organizations have a powerful place in shaping the city of Dallas. 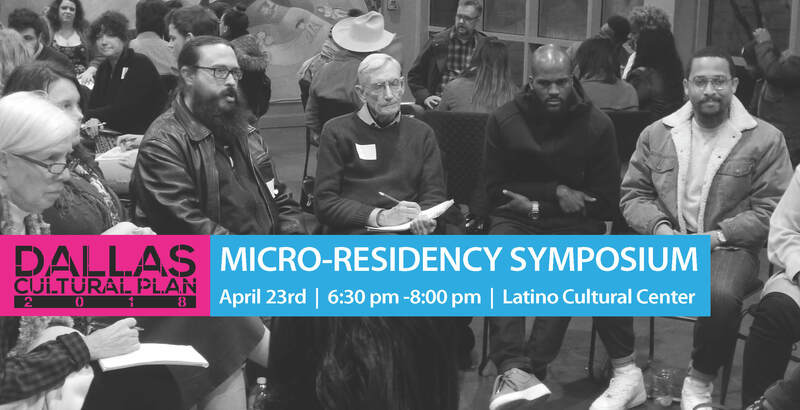 To that end, the Dallas Office of Cultural Affairs (OCA) has embarked on a “micro-residency” as a part of its cultural planning process. Join us Monday, April 23rd, 6:30-8pm, to hear from participants about their experiences and recommendations for continuing to integrate the arts into City practices. – Formulate and propose strategies for the creation of a formalized (ongoing) residency program. The artist residency is a crucial part of the Dallas Cultural Planning strategy development process. It will establish a shared understanding of the ways that City departments work as well as the artists process and break down silos by providing practical ways for them to work toward shared goals.